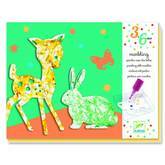 Create your own funny animals with these colourful wooden puzzles from Djeco. Match the pieces to make nine different animals or mix and match their heads, tummies and legs to create amusing animals of your own. Contents: 9 puzzles. Age 2+ years. Box size 21,8 x 18,8 x 3,2 cm. A real game of golf to turn your garden into a golfing green! Includes 2 x wooden golf clubs, 3 x flags, 2 x golf balls and a bag. Box 58 x 22 x 6cm. 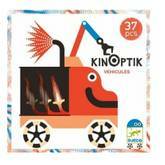 A series of really simple 2 piece puzzles that become articulated vehicles. 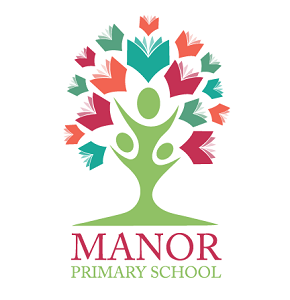 There are 6 different vehicles which include a digger with a moving bucket; a crane with a swinging hook; a fire engine with a stretching ladder. 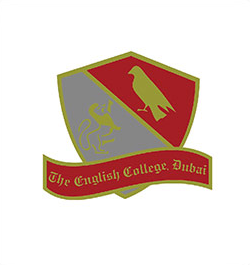 The jigsaw pieces are made of thick cardboard and are contained in a sturdy box. 12 cardboard pieces (6 with articulated feature). Beautiful set of 5 Kawaïland stencils for drawing. The 5 stencils are made of plastic and have slits to help guide the pencil. 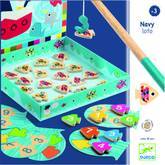 Djeco's Navy Loto is a fun family game for children 3 years and over. Go fishing for the fish with corresponding colours or numbers to your card with the magnetic fishing rod. First person to fill their card wins! Everything stores away neatly in the sturdy cardboard box. Navy Lotto contains 24 fish, 3 colour cards, 3 number cards and a fishing rod. 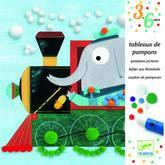 This educational puzzle is for young toddlers and pre-schoolers aged 3 years and upwards and the entire range has been designed to be educational yet fun. Beautifully illustrated, your child has to match the number on the train carriages to the correct number of animals to put in the carriage. This large puzzle is designed to help young toddlers and pre-schoolers learn their numbers as well as colour recognition and matching. A total of 20 pieces. A new fun painting set by Djeco, just put the shapes in the box and then add the three marbles daubed with large drops of paint. Close the box and shake hard.. Surprise! Includes 8 backgrounds, 24 animals, 4 pot of paint, 3 marbles, painting box and colour instruction booklet. Featuring an evocative print designed by Martyna Zoltaszek, this 1000 piece puzzle by Djeco will keep anyone entertained throughout the day. 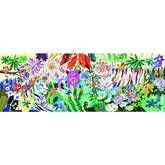 Full of vibrant rainforest details that include rainbow coloured tigers, this unique and creative jigsaw even includes a full size poster of the finished piece to decorate your child's bedroom with! Add the sparkly square mosaics to the beautiful butterfly themed images. 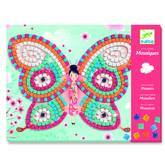 Children follow the colour code indicated on the sheets and stick on little squares of sparkly, self-adhesive foam to embellish the wings of these beautiful butterflies. Comes with two cards to decorate and 7 sheets of glittery mosaic squares. Great for building fine motor skills. 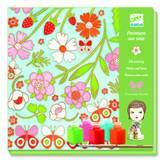 This amazing Thumbalina art pack has everything kids need to take their art work to the next level and create spectacular, detailed masterpieces. The images are gorgeous and kids wont be able to wait to get started. Presented in a lovely box. 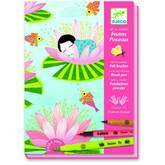 Includes: 4 illustrated sheets to be coloured with the felt tip pens included. 7 felt tip pens are double ended, point on one side, fine tip point on the other. Detailed step by step illustration booklet included to teach kids new techniques. Celeste Kumihimo Bracelet set to create gorgeous jewellery of your own. 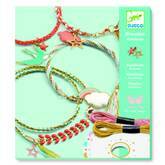 Weave cotton yarn and assemble charms to make beautiful bracelets based on traditional Japanese art. Features a nicely decorated braiding tool, illustrated charms and specially selected designs of thread to create eye-catching and stylish pieces. This beautiful set has a bird and star theme. 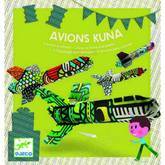 Colour the 4 aeroplanes and send them flying through the air! The magic takes place at the tip of the paintbrush, after stretching the silk over the frame, delicately add the colours with the paintbrush. The pre-printed contours keep the inks from running. Dry the ink with a hair dryer and you are ready to wear your silk scarf work of art. 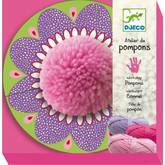 This kit contains a magnetic ring, wool and instructions to make you very own pom poms. 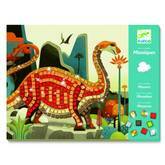 Create sparkly Dinosaur mosaic pictures. Children follow the colour-code indicated on the sheets and stick on little squares of shiny, self-adhesive foam to enhance the colours of these fearsome dinosaurs. Comes with two cards and lots of coloured squares. A beautiful collage activity for younger children where they can add pompoms to colourful animal scenes with pretty coloured pompoms. Perfect for small hands and supplied with a glue stick, children can choose between 4 scenes to stick small pompoms onto. Choose from an engine driving elephant, a bear flying an aeroplane, a cycling dog and a squirrel transporting a plentiful of acorns. 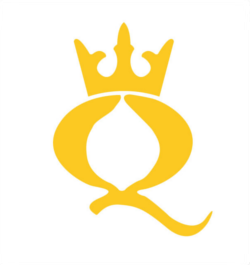 Children can develop their fine motor skills, discover their creativity and have fun creating beautiful scenes they will want to display in a bedroom or playroom. 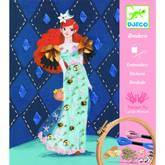 Djeco's Fashion Cocktail is an introductory embroidery kit for children to add threads, beads and sequins to complete the elegant party dress. The kit contains a detailed colour instruction booklet, 2 needles, 2 threaders, 2 packs of coloured threads in blue and pink, 1 spool of dark green thread, an embroidery hoop and plenty of beads and sequins - everything needed to make a beautiful textile picture. Suitable for children 8 years and above, this would make a beautiful gift for anyone with an interest in fashion and learning embroidery. Create colourful animal pictures (choose from a dog, goose, owl or bear) using the 24 sheets of printed background paper and decorate with the 6 sheets of stickers provided. 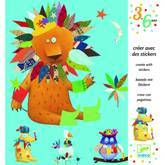 Includes a full colour instruction booklet demonstrating how pictures can be built up using the stickers. The Create Animals stickers are great for long car journeys and a wonderful small gift for both girls and boys alike. 6 Brightly colours farm animals with 6 stacking boxes. 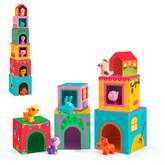 Stack up the boxes and put the animals in their houses or line them up in size order! There's lots to do with this imaginative set by Djeco. 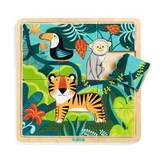 Young ones will be captivated as they piece together this wooden puzzle and watch as the colourful jungle scene unfolds, when the background is complete it’s time to add the tiger, monkey and toucan to the scene. 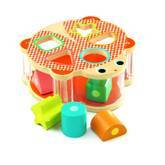 This beautifully designed puzzle is a great way to develop the imagination and improve thinking skills as your little one decides where each piece will fit. This tray puzzle has 12 jigsaw pieces plus 3 animals to insert. You must use all your skills of creation, construction and imagination to get the best out of this eccentric and unique pack! Create futuristic vehicles by piecing together a selection of wacky illustrations and watch them come to life with magnets. 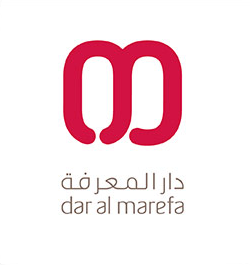 Discover games of imagination, construction and animation. 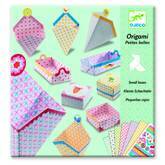 An introduction to origami, with a very simple step by step approach for young beginners, who will then have fun finishing off their animals with stickers. 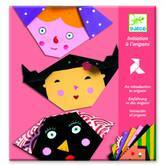 This pack can make different faces, it contains full instructions, 3 sheets of stickers and 20 origami papers. 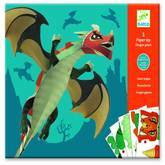 You remove, you fold, you stick and a giant dragon comes to life. 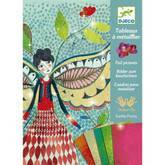 Includes 1 step by step color instruction booklet from Djeco. Package Size: 32 x 24 cm. Dragon approx. 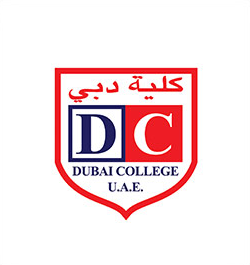 60 cm in length. 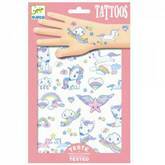 Unicorn themed temporary glitter tattoos by Djeco. Contains 2 different sheets of dermatologically tested tattoos. 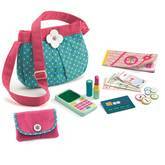 This bright and fun set comes with a stylish handbag with an adjustable cross the body strap, and accessories that include, pretend mobile phone, money, credit card, cheque book, purse and lipstick. 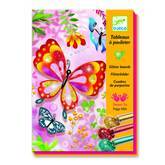 Make the butterflies come to life with glitter! 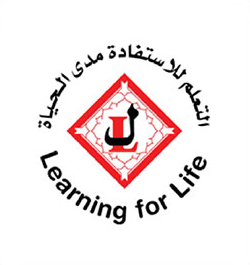 Suitable From 7 to 13 years. Create 3 different types of small origami boxes from a selection of pretty paper sheets and add the stickers for a decorative touch. Using the little tool, you uncover parts of the picture. Then you apply the foil paper to the sticky areas underneath. The thin layer of metal sticks to these areas, and the picture glistens, as if by magic! Designed by Elodie Nouhen. 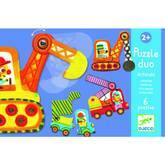 Djeco Observation Puzzles are a range of kids jigsaws with an added twist – first make the puzzle and then find the objects around the border hidden within the puzzle itself. Even better each jigsaw comes with a free poster sized 38 by 61cms too! 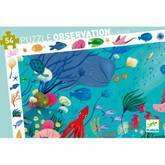 A bright, beautifully illustrated puzzle with a whole host of aquatic animals. With 54 pieces this puzzle is ideally suited to children from 4 years old and will be very popular with both girls and boys. Rich in surprise and detail the border of this jigsaw has items to be found within the completed puzzle – can you find the octopus, green shell, crab and striped tropical fish? 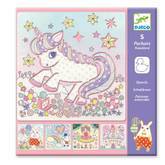 Jigsaw puzzles are a favourite activity to help develop patience in children and extremely rewarding when completed.